Description: 2019th-THE CIRCLE-HAUNTED VILLA : Your next task is to go to the Haunted Villa in North America. There you have to help the man who is controlled by a darkened soul. Now you have to do some magic to release the man from the dark soul. 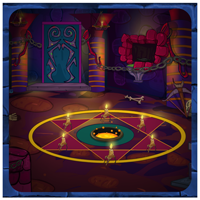 Find necessary objects and solve the interesting puzzles and clues to do a magic. Hurry Up! Keep going.